There’s a perception that we’ve been flooded with cinematic treatments of the Nazi Occupation of France in the decades since it ended. There have been a fair few, it’s true, but what’s interesting is the way in which those treatments have changed over the years. 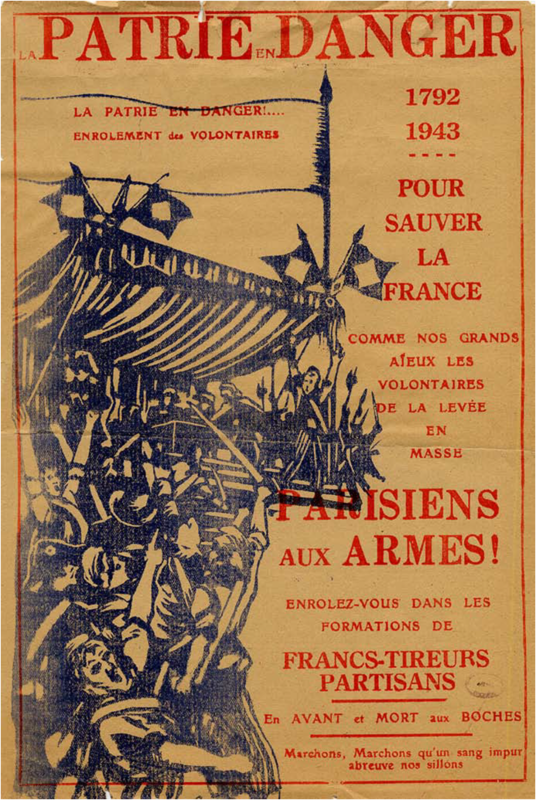 At the Liberation, the notion of France as a nation of resisters was a vital part of de Gaulle’s strategy to unify a country perilously close to civil war. Of course, there was a purge – women who’d collaborated horizontally were publicly shamed, and there were trials, and some executions. But a surprisingly large number of those who were complicit in the implementation of Nazi race laws and in the deportations ended up in positions of responsibility in post-war France. All of this has been talked about a great deal, it’s true, and one might think that it’s all been said, that everyone knows now who was complicit, and how and why, as well as who did resist. But fictional and cinematic treatments of the era have gone through different phases, each adding a layer of complexity and richness to our understanding. The most recent films to contribute to this process have been two about the Vel d’Hiv round up (The Round up, and Sarah’s Key), and two focusing on particular clusters of resistance activity. I’ll come back to the Vel d’Hiv in a future blog. What’s particularly striking about the two recent films about the French Resistance is that in these cases, the resistance was not, strictly speaking, French. Robert Guediguian’s Army of Crime starts with a roll call of names, each one followed by the words ‘mort pour la France’. The names are Armenian, Polish, Italian, Spanish, Hungarian, Russian, some are difficult to pronounce, and the speaker stumbles for a moment, and goes on. We see them on their way to imprisonment, ‘trial’ and execution and then we go back to see how they became martyrs for a country to which they did not belong. But the Army of Crime – so called after the Nazi poster which aimed to alienate the populace from the resisters by emphasising their criminal acts and their foreign origins – was made up of people who had very little to lose. From the start of the Occupation, as Jews, and/or Communists, many of them refugees from parts of Europe which had fallen earlier to the Nazis, or from other persecutions, they knew they were targets. Some of them joined the armed struggle due to some personal confrontation, others after their families were swept up in the round ups and deported. They fought and died for an idea of France, the France that they had seen as a refuge, even whilst that idea was being betrayed, as they were. For the resisters in the new film, Free Men, it really wasn’t their war. As Moslems they risked being rounded up only if they were mistaken for Jews and could not prove otherwise, or if they were involved in communist workers groups. But the Paris Mosque was a place of refuge both for Moslems who were involved in the resistance, and for Jews. The scale of this activity is not known – estimates vary wildly – but it seems clear that the head of the mosque, Si Kaddour Ben Ghabrit, instigated and supported the production of false papers for Jews, and the use of the building itself as a hiding place, whilst maintaining outwardly amicable relations with the authorities. 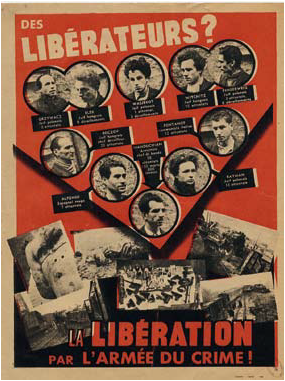 Louis Aragon and Paul Eluard wrote poems about L’Affiche Rouge, and there were earlier films, though one screenplay was rejected on the grounds that these foreigners gave the wrong image of the Resistance. Free Men isn’t the only film to tell the story of the Moslem resistance – Mohamed Fekrane’s Ensemble came out this year too, though it hasn’t reached the UK yet. Army of Crime had a very powerful resonance in the context of the anti-immigrant/anti-refugee rhetoric that is spewed out by sections of the press here and across Europe, as does the story of Moslems risking their lives to save Jewish lives. These young men from North Africa are the brothers of the Allied soldiers in Days of Glory, which told of their part in the liberation of France, and their betrayal after the war by the French government. If Free Men had less emotional heft than Army of Crime, it’s not down to the story. It’s to do with the leading character. Manouchian and his group were from the start politically engaged, passionately committed to the struggle, with a sense of the wider European context – the Armenian genocide, the Spanish civil war. They’re articulate and charismatic. Younes at the start is a black marketeer, willing to spy (rather ineptly) on the activities at the Mosque in exchange for an official blind eye being turned to his business dealings. He’s nudged unwillingly into the resistance by his cousin, who’s already actively involved, and by his realisation of the danger faced by his friend Salim, a Jew passing as a Moslem. Little by little, he’s drawn in until he is risking his life for the cause. The problem is that as a focal point for the narrative he is somehow a bit blank, passive, lacking in real depth. He reminded me, in fact, of Lucien – Lacombe, Lucien. Louis Malle’s ‘hero’ is an accidental collaborator – a combination of pure chance and his own naivety and vanity put him in a position where he can bring down local members of the Resistance which had rejected his bid for membership. He’s an ambivalent and ambiguous character, and his portrayal has been controversial, because Malle refused to resolve the ambiguities. When Lucien shoots a German soldier and escapes with his Jewish girlfriend, did he do so to save her from deportation, or because the German had taken something he regarded as his? If Younes had not been so powerfully drawn to Salim, would he have allowed himself to be drawn into the Resistance? Lacombe Lucien is a powerful film because of this opacity, which prevents us from taking refuge in simplistic polarities. Malle’s film, which appeared in 1974, not long after Ophuls’ The Sorrow and the Pity, opened up the possibility of more complex narratives of the Occupation. In Free Men the really interesting characters – Salim, Leila and the Imam himself – are sketched in as we focus on Younes, who we barely know better at the end of the film than we did at the beginning. Nonetheless, it’s a gripping film, a story that needs to be told. We’ve moved since the Liberation from the Gaullist myth of the inextinguishable flame, through the exposure of collaboration and complicity, towards a celebration of the real rich diversity of that struggle against barbarism. This entry was posted on June 10, 2012, 4:44 pm and is filed under Film, Second World War. You can follow any responses to this entry through RSS 2.0. You can leave a response, or trackback from your own site.